3E Software Solutions offers a customized Moodle Mobile App with a vast array of features. Why is a Moodle Mobile App required? Moodle is the leading LMS platform and the go-to solution for most who want to start a Learning Management System. To put it simply, Moodle works for most people from those who run small systems for Home Schooling to Large University groups. Add to that the increasing penetration of Mobile devices into all aspects of businesses, it becomes imperative to take Moodle to Mobile devices. To facilitate learners who want to learn on their mobile devices on-the-go and to empower LMS providers who want to enable their learners to do so, we offer custom Moodle Mobile App solutions for Android and iOS devices. Who will benefit from the Moodle Mobile App? Enables students to learn on the go. What does the Moodle Mobile App feature? The student can view all the courses that they have enrolled for. The app shows the list of courses for which the user has enrolled. The student can view various topics of a particular course, the syllabus for a particular course, the resource that are given out by the teacher for each topic (pdf, ppt etc. ), all within the Moodle Mobile App. They can also view the active discussions of that particular topic. The student can send messages to other students or to the teachers without leaving the Moodle Mobile App. This features provides students an opportunity to discuss on a topic with his/her fellow students on a specific topic, The users can also messages to the teacher on seeking help for a particular topic. The app supports multiple languages such as Spanish, French, German, Polish etc. The students can login into multiple Moodle sites with their registered username and password within the same Moodle Mobile App. This feature is helpful when the users is taking courses in multiple domains For example: Technology, Arts, Songs etc. The users can also switch between the sites as required. Students can share the app on WhatsApp, Email, Twitter and Messaging. Cache management is one of the most vital features of the Moodle Mobile app. This makes the app faster and easier to use. Once the user accesses a particular course, the contents will be stored on the local storage. If the student accesses the same course again, it will be fetched from the cache. The cache can also be cleared manually or automatically. The App also has an option where the user can visit the web version of the Moodle site for managing the profile or for managing the payments. 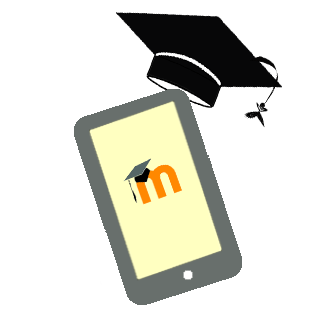 Try our Moodle Mobile App for Free! Download the android app by clicking the link below .